ECON Pool & Snooker table recovers on the Costa del Sol, Spain. Econ pool and snooker can undertake all types of billiard table cloth recovers, Snooker, English pool, American pool, Carom or other. 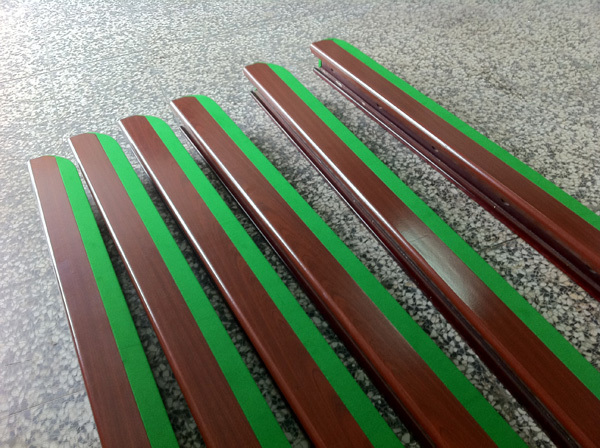 We carry Stratchen 6811 napped green snooker and pool baise in stock along with basic cut sizes in most colours for 7' English pool tables and cushions. 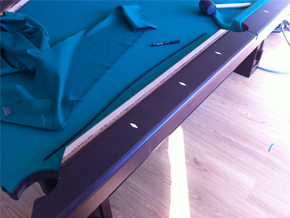 We carry cloth for American pool tables in green standard quality although we have access to other colours and qualities if needed. 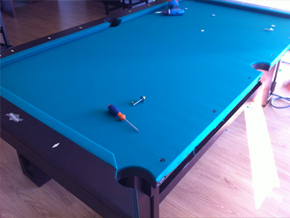 We are continually recovering tables, mostly snooker, English pool and American pool tables, so we know what we are doing! 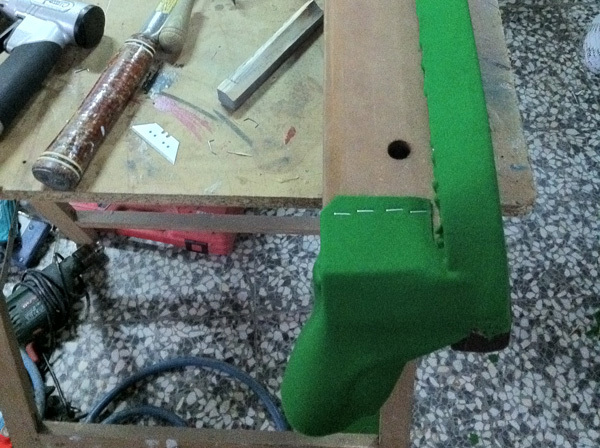 Quality cloth is not cheap, we ourselves would never spend money on a quality cloth then not make sure we had the table covered properly, why would you? Don't join the others on the Costa del Sol who have spent a lot of money on cloth then not ended up with their billiard table covered to a profesional standard. 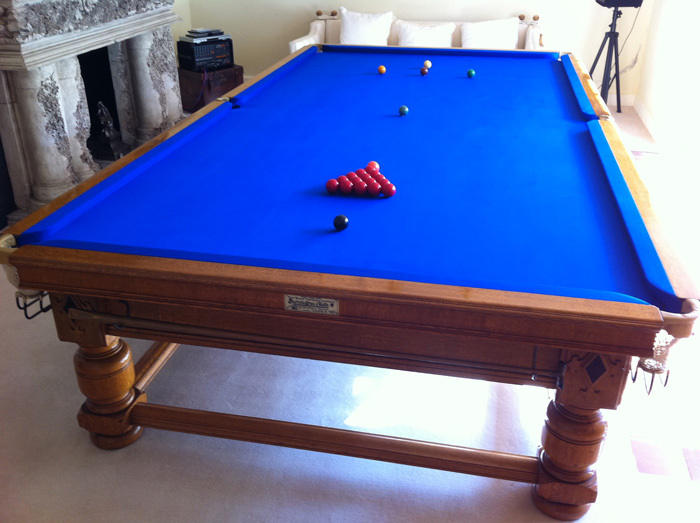 Snooker table cloth is now generally fitted onto the cushions using staples while the cloth around the slate should still be fitted onto the slates timber slats using upholsterers tacks. 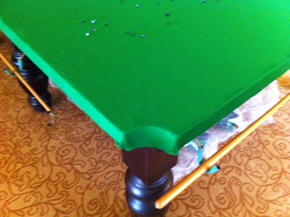 The reason for using upholsterers tacks to attach the bed cloth of a snooker table is for two reasons, 1) To get the cloth to fit around the middle pocket area of the slate it may need to be released and then stretching several times in some areas when covering. 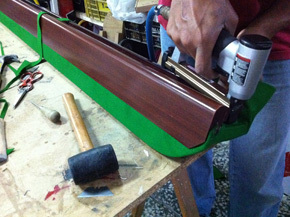 2) Because the cloth will generally need re stretched after a period of time. Having the cloth held on by tacks means it can be released and re tacked easily for stretching. 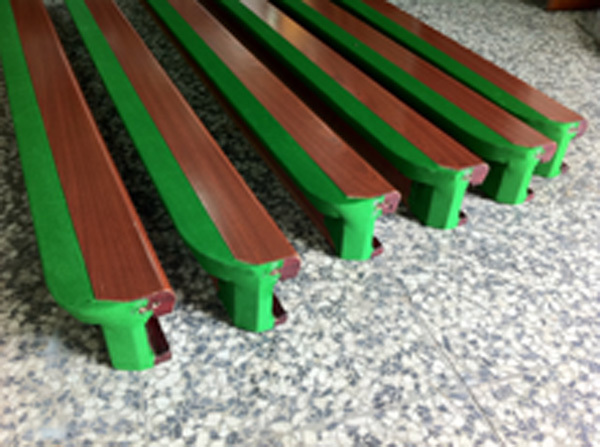 The time for snooker cloth re stretching depends on several factors such as usage and humidity. 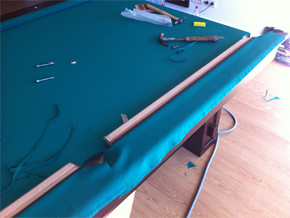 Most of the tacks are left with their heads proud so a tack remover can be used to quickly release the tack when needed during fitting or replacement, another reason for not using staples on the bed cloth is because the cloth is under quite a lot of tension, pressure from the stapler tongue can cut the cloth... so using staples is not the way to fit an English snooker table cloth although from what we can see on our travels some people seem to think it is!. English pool table cloth is generally stapled to the cushions and glued to the edge of the slate, some companies use spray glue for this but we ourselves prefer the old fashions way of just brushing the glue on, this way the glue goes where we want it to go and the recover time on cleaning the slate when we next recover is cut down. 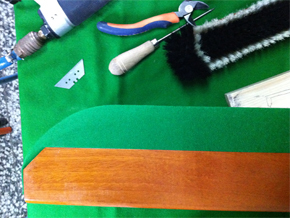 We also find using a quality contact adhesive makes for a much stronger bond that given when using spray glues. American pool table cloth is generally stapled onto the cushions while stapled to a timber slat around the slate, there tend to be more options on American tables, some tables have the cloth glued to the slate and SAM have a velcro system (Setax system). Full size snooker table cushion recover. 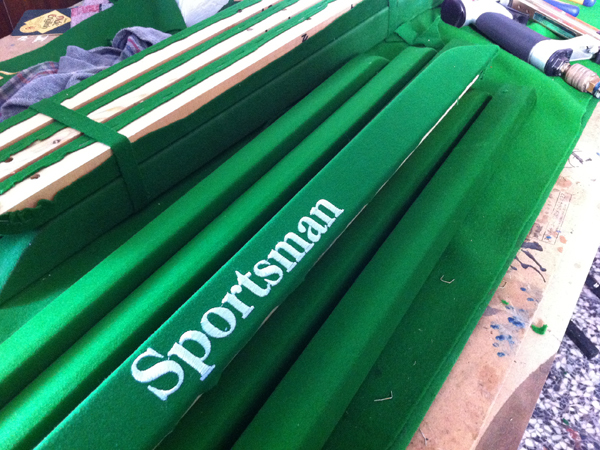 This is a set of cushions from a full size Titan snooker table being recovered in Stratchen 6811 Club snooker cloth. The end of the cushion. The end of the cushion finished. Snooker table recover San Pedro. 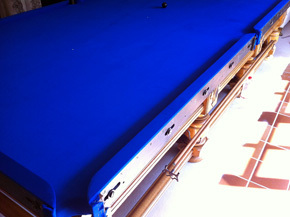 This is a full size snooker table being recovered in blue Stratchen 6811 Tournament snooker cloth. Note the cloth is stretched fully around the slate of the pockets without any cuts! 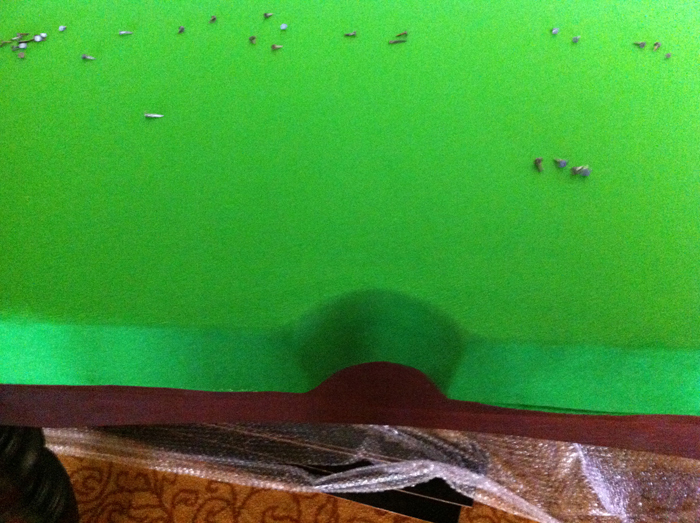 this is the correct way to cover snooker table pockets. This table has steel block cushions as can be seen in one of the images, the cushion block is then covered with a timber capping to finish the cushion structure (See final image). 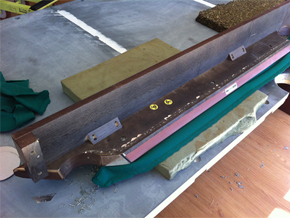 Bed recovered, cushions being fitted. 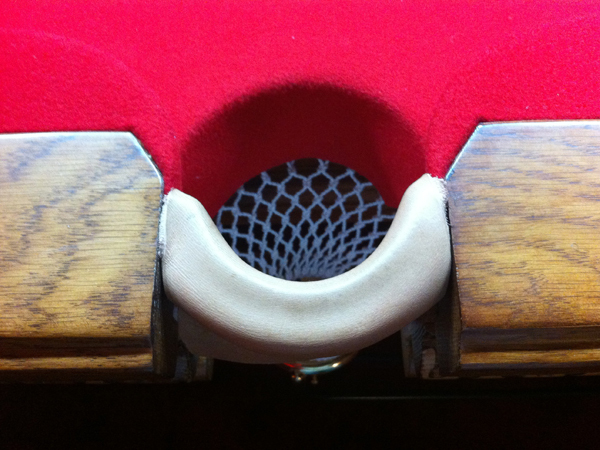 No cloth cuts on middle pocket! 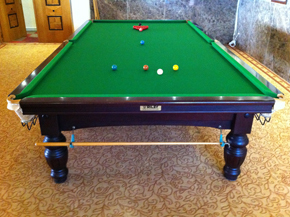 Full size snooker table recover Marbella. This is a full size snooker table we recovered while installing in Marbella golf club, this table and cushions where covered in Stratchen 6811 Club snooker cloth. 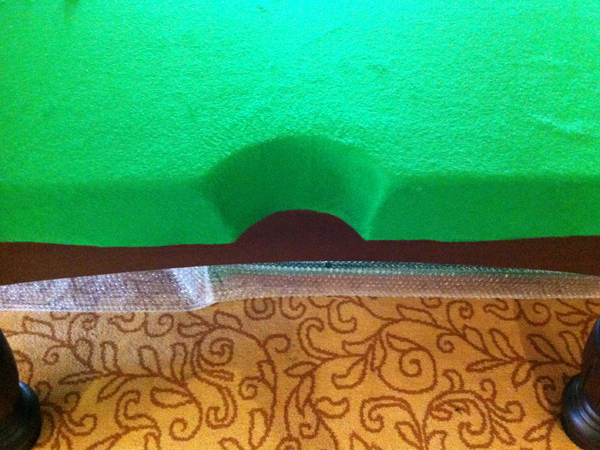 One of the biggest things we find on most snooker tables on the Coast is that the cloth has not been covered round the middle pockets properly, this might not worry some people but the proper way to recover a snooker table slate is for the cloth to reach round the slate and not have a 'V' cut down the middle of the pocket slate facing, with the cloth fixed to the underside of the timber slat batton. 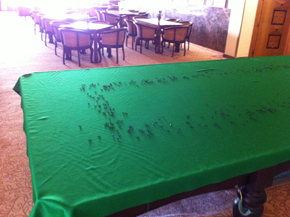 Tacks laid out - No staples! 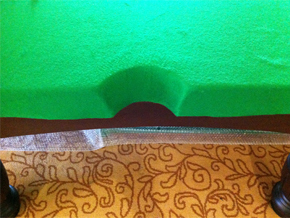 Middle pocket with cloth around slate. Covered with 6811 club cloth. 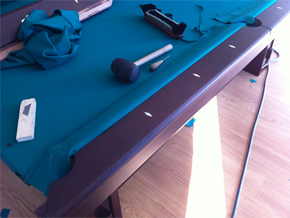 The table recovered with new cloth. 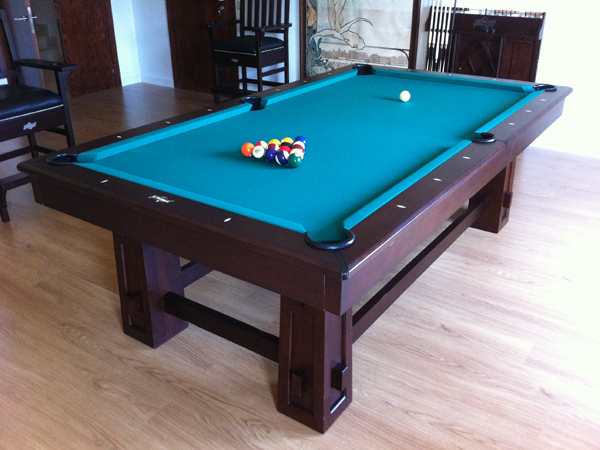 9' American pool table recover Benhavis. 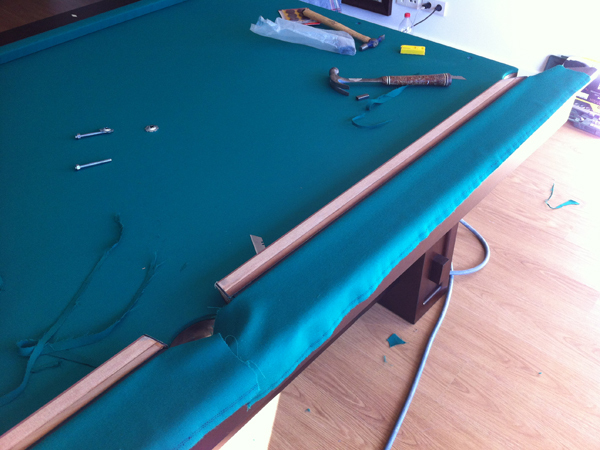 This is a 9' American pool table we recovered in Benhavis, this table and cushions where covered in Ivor Simonis pool cloth. 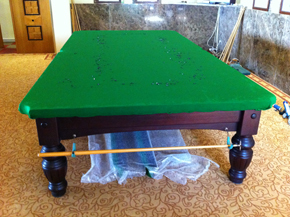 Cushions and slate cloth is removed and the table cleaned down, level checked and then the new cloth is put on the slate bed and then the cushions are fitted. The small woodworm type holes are actually an effect that this American Heratige table has! 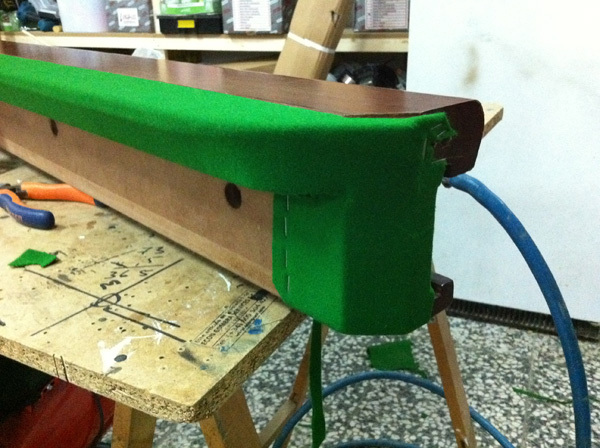 Cloth with top strips in place. 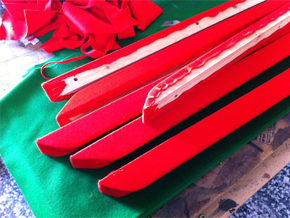 Cushion cloth ready to be stapled. 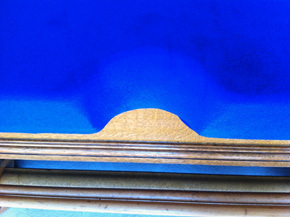 Table ready for last two cushions. 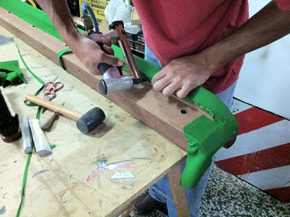 Various images of some recovering work. This is a selection of several images at different stages of recovering on pool and snooker tables. One of the important things to notice is that the middle pockets on the tables 'Specifically snooker tables', are covered down and round the slate and timber slate. 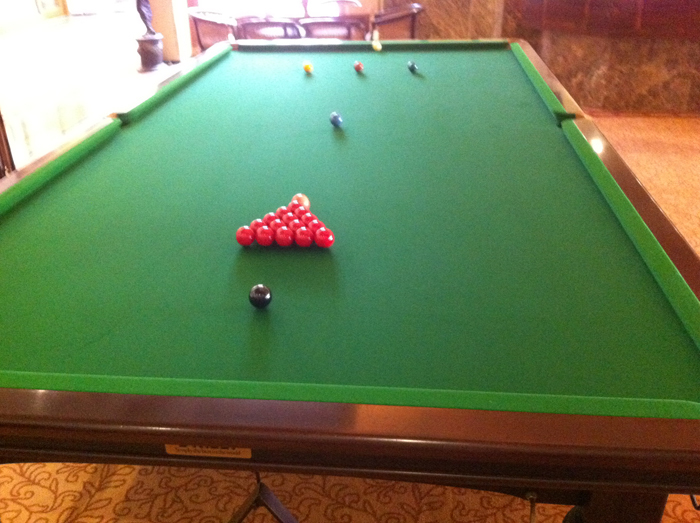 This is how snooker tables are supposed to be covered. We come across on the Coast many tables were the cloth has been stapled around the edge of the pocket and 'V' cuts on the middle pockets, with bits of cloth stuck in to try and hide the cut, those methods are both wrong and look ugly. 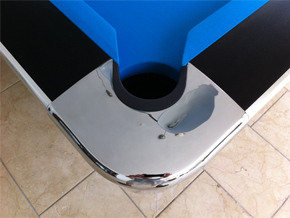 You can see here in the images on our site how well the pockets look when covered correctly. 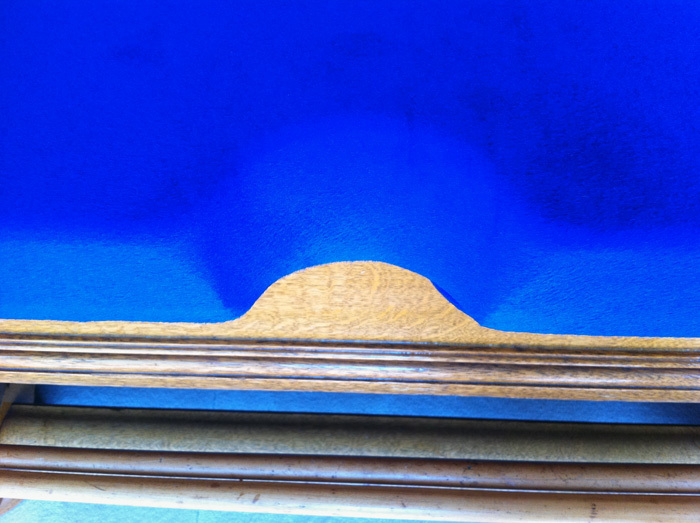 Cloth covering the full edge of pocket.